My son has the opportunity to play a game on the Blazers court today, so I’m going to be watching him have the time of his life rather than shoot a new recipe today. 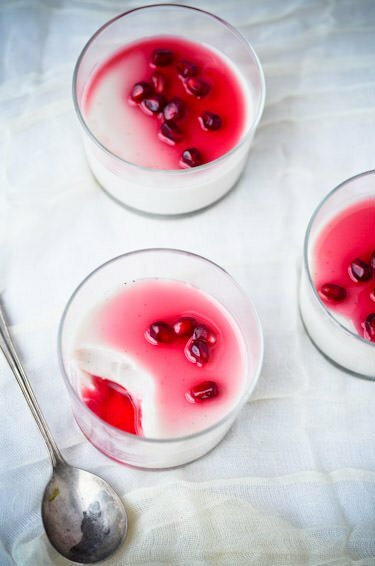 This is one of my favorite posts that I did for Blissful Eats it’s a vegan version of panna cotta infused with toasted coconut and topped with a tart pomegranate syrup. This is a perfect dish for Valentine’s Day with it’s beautiful color and a nice change from all the chocolate desserts that are so prevalent. It comes together in a matter of minutes but it does need to chill for at least four hours so it’s the perfect make ahead dessert. It utilizes agar agar which is a great alternative to gelatin if you are cooking for a vegetarian. It is derived from a wild sea vegetable, is odorless and tasteless but can be substituted in any recipe that calls for gelatin. 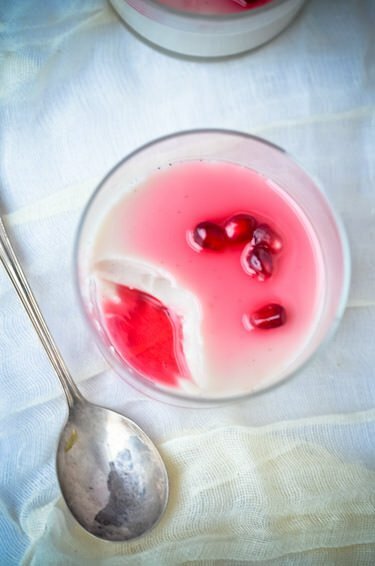 The pomegranates and lime add a nice tartness to the creamy sweetness of the toasted coconut. Pre-heat the oven to 350 degrees. Spread the coconut on a parchment lined baking sheet and bake, stirring once or twice, until golden, about 5 minutes. In a small bowl sprinkle the agar agar or gelatin over the water and stir. Set aside to let the gelatin bloom. In a small saucepan heat the coconut milk, sugar, toasted coconut and vanilla bean and bring to a boil. Whisk in the agar agar mixture and continue to boil for one minute. Strain the coconut milk into a mixing bowl. Divide the coconut mixture evenly into three serving containers and refrigerate for 4 hours or until set. 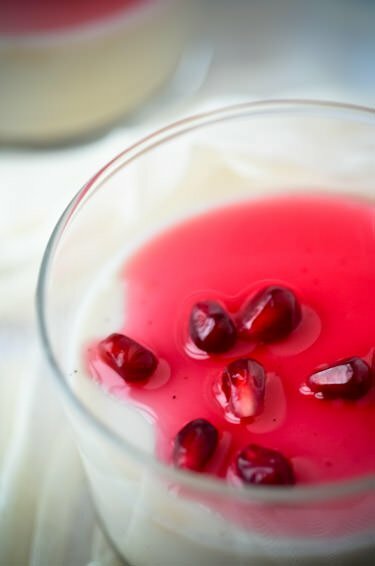 To serve, spoon a tablespoon of the pomegranate syrup on top of the panna cotta and garnish with a few pomegranate seeds. Scrape the seeds from the vanilla bean and place in a small saucepan. Add the sugar, pomegranate seeds, and water to the saucepan and bring to a gentle simmer. Cook for five minutes until the syrup has taken on some color and coats the back of a spoon. Add the lime juice and set aside to cool. These are really beautiful! The color from the pomegranate is so pretty! Thank you! It’s a really simple recipe but is great for a party since it looks like you spent a lot of time and effort on it!